SKU: JFX008. Category: Biome Series by John Fox. Now that I am a little further down the line with this project, I have found it increasingly difficult to find subject matter. The problem is to find an object that is not too solid, as I need the little windows in which to place the animal silhouettes. 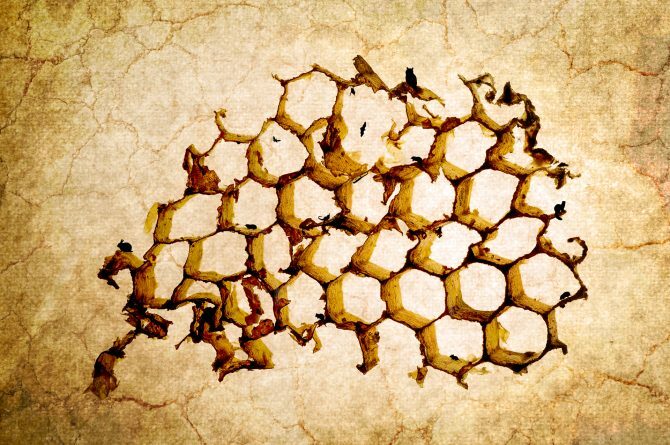 After much pondering I thought of honeycomb from a beehive as a potential natural object. While wondering about where I would find some honeycomb, I came across some discarded it in the street. Someone had tried to remove a hive from a tree and the ground was strewn with just what I was looking for. I brought the honeycomb home in a Tupperware and began shooting it. It took some experimenting and playing around to work out how to best capture it. It looks gorgeous back light but it was quite a dens structure so I needed to thin it out a little. I also had to work quite quickly as the honeycomb was melting from the lights. I had wanted to do an ?under the ground? theme and this leant itself to my vision because of the tunnels formed by the honeycomb. This image is best viewed very, very large as the structure of the walls is fantastically intricate and delicate. On my first attempt at adding the little animal silhouettes to this image I got there scale quite wrong. After reworking it I am very pleased with the result as the balance is just how I had intended. The best part of this image has been the wonderful smell of honey which has filled my office.